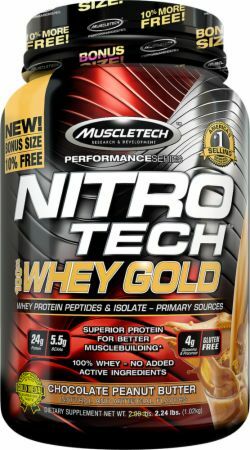 MuscleTech-sponsored athlete and Team Bodybuilding.com member Abel Albonetti is a huge fan of high-volume workouts designed to test your limits. He knows they help build muscle for a balanced physique and push your training intensity to new heights. "This workout is something I do to bust through plateaus," explains Albonetti. "I don't like to use this workout every single week, because it is extremely taxing on your muscles. But if you feel like your gains are slowing, or you just want to kill your shoulders, try this workout." If you've seen his How to Get Six-Pack Abs Using Supersets workout, you know when Albonetti says it's a killer, he's not messing around. With 11 exercises—including supersets, dropsets, and giant sets—this workout is guaranteed to destroy your shoulders. Starting off with this exercise allows you to lift really heavy weight without using a spotter. For each of the 5 sets, increase the weight, drop the reps, and try to reach failure. Start with 12 reps, then drop to 10 for 2 sets, then 8, then 6 reps on the final set. Perform a dropset on the final set. Grab heavy enough dumbbells to fail at 6 reps, then drop the weight by 20 percent. Immediately hit the press again until you reach failure, then drop the weight by 20 percent again. Do one last set to failure. To target the shoulders, Albonetti performs this movement behind the neck, taking care not to go lower than his ears to avoid injury. "I like to do this exercise standing because it involves the core," he explains. "You're working your entire body." To add more volume to this exercise without lowering the weight, complete 5 sets of 8-10 reps, keeping your core engaged and your neck neutral. It can be tough to isolate the shoulders during lateral raises, so Albonetti offers this tip: Lift your arms straight out, then "pour" the dumbbells out at the top so your pinkies turn upward. This engages your shoulders a little bit more by rotating the shoulder joint. Use the same dumbbells as you move straight into the upright row. Bring your elbows up as high as you can. Squeeze at the top and pause for a second before going straight back down. With both exercises, keep your chest up and avoid using your traps to lift the weight. Complete 4 supersets of 12 reps of each exercise. For this exercise, perform 2 sets with the cables in front of your body, and 2 sets with the cables behind your body. This ensures you're hitting your shoulder from all angles. Albonetti also recommends leaning away from the cable machine to keep tension on your shoulders throughout the whole range of motion. Shoot for 4 sets of 12-15 reps. The reverse fly does not allow you to use a lot of weight. That's OK, says Albonetti. 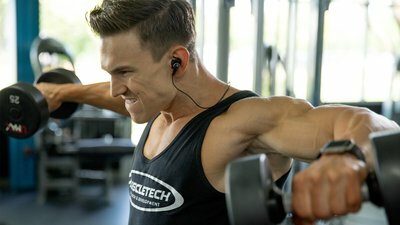 "You want to establish a mind-muscle connection," he explains, "which is easier to do with lighter weights and more focused movements." Lift the weights at a wide angle. "Too many people go straight up and involve their back more than they should," Albonetti says. "That's not what you want." Complete 12 reps before moving on to the face pulls. The same rules apply for the second half of this superset: Use lower weight and more focused movements to light up the rear delts. "Make sure with the face pulls that you're getting your elbows up high, pausing at full contraction and squeezing," says Albonetti. "The point is to engage the rear delts." Rest between each superset before hitting it again. Target all angles of the traps by performing 3 sets of this exercise with the bar in front, and 3 sets with the bar behind. "Working traps and doing shrugs, I don't do crazy amounts of weight," says Albonetti. "It's all about the mind-muscle connection." Time under tension gains in importance when you go lighter, so slow this movement by squeezing up at the top, pausing for a split second, then stretching back down. Each of the 12 reps should be challenging, so take your time and think about the muscle you're working hard to build. "This will be your burnout set," explains Albonetti. "You're going to use the same weight for all three exercises, so pick a weight you can do back to back to back without resting." Keep your back straight on the seated side raise and avoid swinging. Focus on pausing for a split second at the top and going slow on the way down. Keep tension on your shoulders the whole time. Squeeze at the top of the dumbbell front raises and pause just like you did with the side raises, keeping your chest up and your back straight. With the reverse fly, use the same wide motion you did earlier in the workout, keeping the tension in your rear delts as constant as possible.